Clients often ask a dead loved one (through me during a reading) to send them a sign. Sometimes clients are so anxious for some indication that their loved one is close. My heart goes out to my client with compassion when I sense my client’s anxiety because I sense that the anxiety is rooted in a feeling of abandonment. Without fail. Every single time a client has been asking for a sign from their dead loved one (before having reading with me) the loved one in question has been sending signs. Unfortunately, the client hasn’t recognized the signs. As a medium, I try to educate my clients, based upon my perspective, whenever I can. I caution people that sometimes a bird is just a bird or a song is just a song. However, if you pay attention, and are open to the possibility, you will generally be rewarded with a wonderful gift from Spirit—the gift of a sign that your dead loved one is still present in your life. if there are several inter-related clues that ultimately lead me to think of my dead loved one. On Saturday, Kent and I were gone most of the day running errands, part of which included driving separately to have one of our vehicles serviced. After we picked up the vehicle and separated to drive our respective vehicles home, Kent received signs from his father. In Kent’s 5-minute drive to his last errand of the day, Kent heard a song on the radio that was on his mind frequently the week after his Dad’s death, so now he associates that song with his father. He then stopped to do his final errand. Shortly after Kent got back in the car for his final 5-minute drive home, “Three Little Birds” by Bob Marley came on the radio. 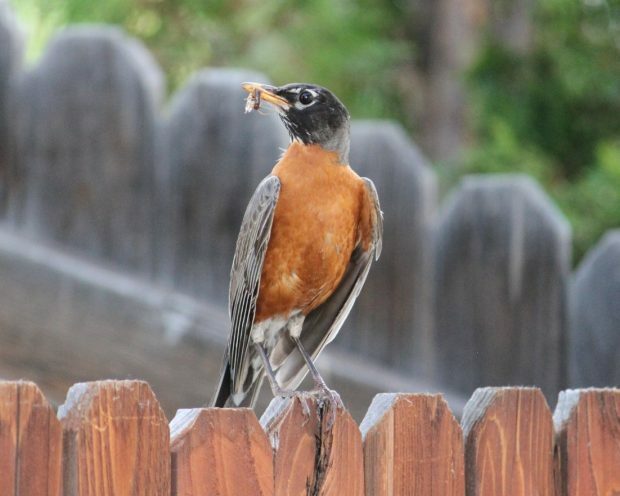 After Kent got home, we noticed some robins in the backyard. I told Kent that they were basically tame. I had observed one of them in the backyard a couple days prior and he/she didn’t immediately fly off, but instead allowed me to go about my business of watering my garden for a few minutes. Kent then told me about the songs he’d heard on the way home. We both teared up thinking about “Three Little Birds” because we felt the message from Kent’s Dad loud and clear that “everything will be ok”. At first we just noticed the one robin, but then we noticed a nest. Guess what!? 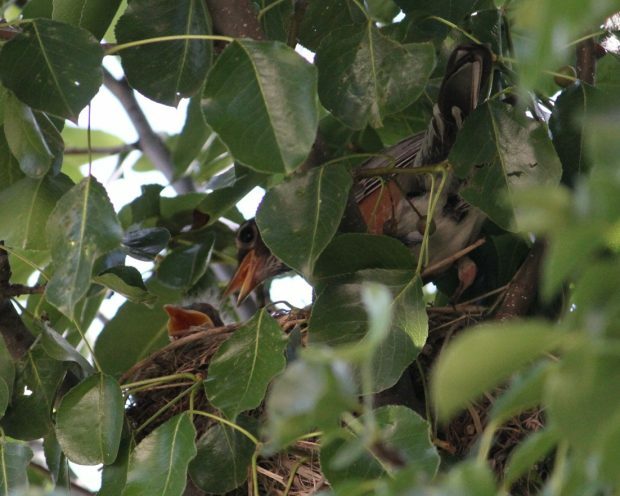 We saw our three little birds—mama, daddy, and baby. Which, by the way, was Kent’s family structure for a while until his younger brother was born. Please know that in every case—personally and on behalf of clients—of which I’m aware, our dead loved ones are trying their very best to communicate with the living. Our dead loved ones in Spirit use signs and symbols to communicate with us regularly. Some dead loved ones are more adept at communication, others are clumsy, but love doesn’t die. The dead are attempting to connect with all of us. Be patient and open to the possibilities. Don’t be disappointed if your loved one doesn’t communicate in a specific manner. Instead, look for extraordinary occurrences and everyday goings on that cause you to think of your loved one.